Whenever I go too long with my natural hair color and texture, I start getting very antsy. Last summer, I jumped on the bandwagon and went for the ombré look. After getting fed-up with the damage from the bleach, I chopped my hair into a lob a few months ago and have been letting it grow out slowly. Now that some time has passed, I found myself in that awkward in-between stage– it didn’t have the volume of my freshly cut bob, but wasn’t long enough to style how I’d like to or hold curls properly. Not wanting to fry my hair with bleach again, I decided it was time for another digital perm. I’ve had a few digital perms in the past (see this post for details from one I got a couple years ago) and have always been pleased with the results. The biggest selling point for me is the low maintenance. Digital perms can be quite pricey, but they save on time and hair products. I’ve been so busy shooting portrait sessions on the weekends that I usually find myself throwing my hair into a haphazard ponytail or bun and calling it a day. I want hair that doesn’t require a lot of styling or effort, but still looks fashionable. Enter the Digital Perm, aka my solution for every day beach waves and bedhead. Digital Perms originated in Japan and Korea and are typically only offered in Asian-owned salons. Luckily, there is a vibrant Korean business community nearby with several hair salon options! I chose Dass Hair Salon in Carrollton because of their positive Yelp reviews and because their prices were cheaper than I had paid previously at other salons. Rich, the owner of the salon, did an excellent job of recommending which type of curl would work best for my hair length and face shape, and also encouraged me to color it a shade or two lighter. I was nervous about the color, but ended up loving it! The cost of the Digital Perm alone was $150 (I’ve paid upwards of $300 before) and he offered me a deal of $200 for a cut, color, and perm. After I snapped one last picture of my black, straight, lifeless hair– Rich and his assistant got to work. They started with the color and then moved onto the perm. The Digital Perm process is a long one. It typically takes about 3 hours total. Rich was a complete pro, quickly rolling my hair into the curling rods like it was second nature to him. I was so incredibly pleased with the results and know that it’s going to save me so much time getting ready! Well worth the money to have a few extra winks of sleep every day. The main difference between a Digital Perm and a Traditional Perm is the temperature. 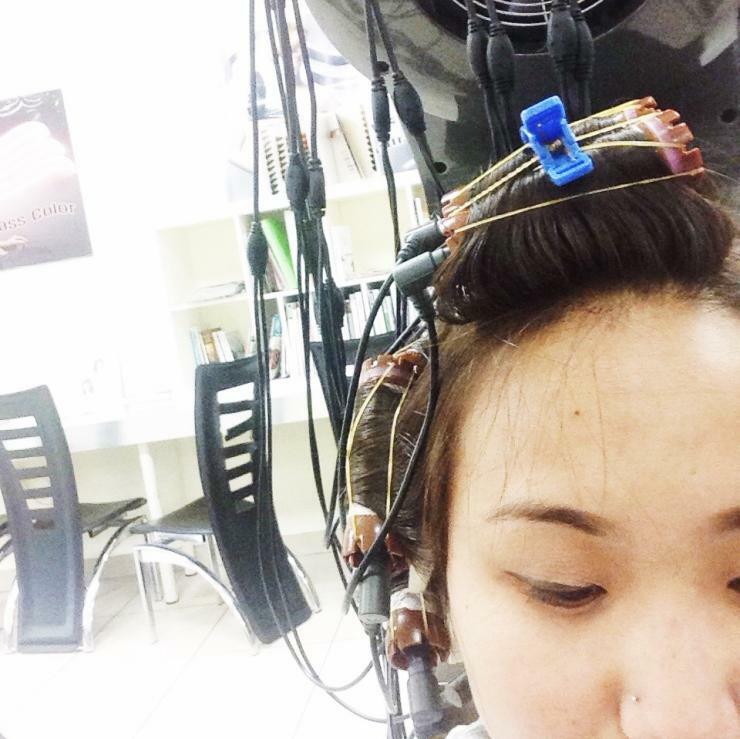 While a normal perm typically requires only perm solution and curlers, a digital perm pairs a different type of solution with heated curling rods connected to a machine that regulates the temperature. Each perm creates a different shape and texture of curl/wave. To put it simply, the wave of a normal perm is most prominent with wet hair and it loosens as it dries. Digital perms are the exact opposite with the wave being most prominent when hair is dry. Because of this, digital perms require less product (ie gel or mousse) to enhance the curls and it looks more natural. The finished look is similar to using a curling iron or hot curlers. Because Digital Perms use heat, the curling rods cannot be used near the scalp. If you need volume at the roots, a traditional perm might be a better solution. Where normal perms can leave hair frizzy or damaged without product, digital perms actually thermally recondition the hair which sometimes leaves the hair softer and smoother than before. They also typically last 3-6 months, which is longer than a normal perm. A Setting Perm is similar to a Digital Perm as it also involves heated ceramic rollers. However, the Digital Perm uses a milder heated temperature where the Setting Perm uses a higher temperature to create more prominent looking curls and waves as opposed to the looser/natural look of the Digital Perm. One time I went into a salon for a Digital Perm and ended up getting a Setting Perm accidentally because the Korean stylist didn’t understand me >.< It wasn't bad, but I like the natural, wavy, messy hair look of a Digital Perm best. Are you tempted to channel your inner K-Pop star and try a Digital Perm? Please let me know if I can answer any other questions for you and stay tuned for updates on how my curls are holding up over time! That is quite the contraption attached to your head! Can’t wait to see your new luscious locks in person tomorrow! LOVE the new hair color and will definitely be looking into a digital perm! It just sounds so cool and looks so pretty on you! Thanks, Erin!! Can’t wait to see you next week!! THIS is probably what I need! I’d love for my hair to look like that 24/7 and not have to do anything! Love it on you!!! It would be so pretty on you!! I think it looks best on long hair! Can you do it on half wavy crazy hair? 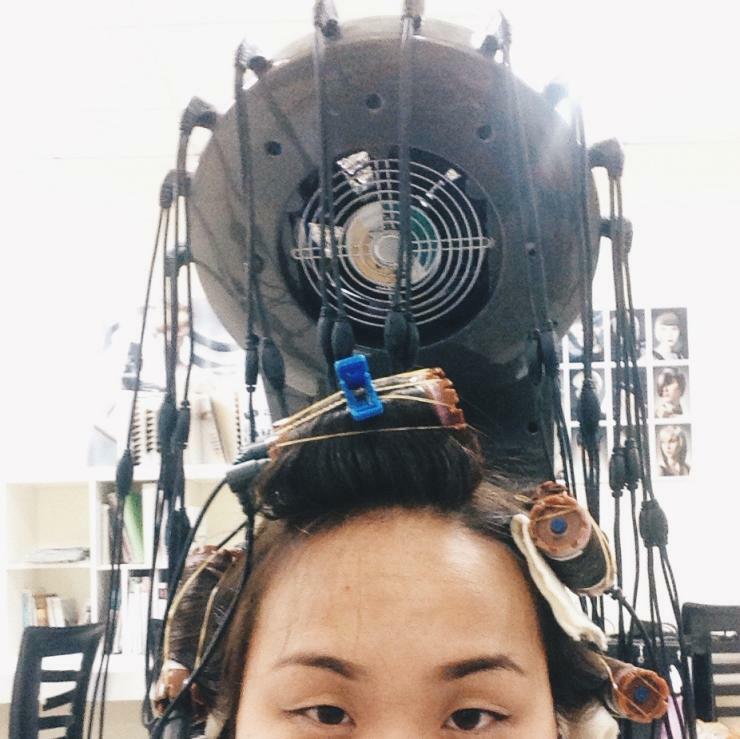 I found your post very informative as I am considering getting a digital perm. I was wondering if you noticed any damage due to the coloring and digital perm. Most of my research has suggested that this is a bad idea, but your stylist actually encouraged it.